I never give them hell. I just tell the truth and they think it's hell. 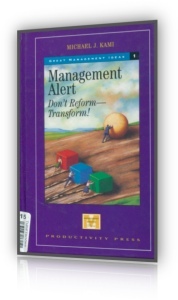 When I was asked to write a relatively short piece about key changes in management of today's enterprises, there appeared, at first glance, a large array of topics. Upon reflection, the choices narrowed to just two. The first and most important influence on the success or failure of a business is the top power holder. A business organization, by definition, is not a democratic institution. The buck begins and stops at the CEO level. That's where full understanding of the new world situation must begin. There also resides the ultimate responsibility for strategy, action, and results. CEOs and their executive teams must change their ways, adapt faster, act differently, and perform better. But they can't do it alone. Thus, the second most important topic must be about people: the managers and the employees. The material for this book was gathered from personal experience as a consultant to many diverse corporations and through direct contacts with CEOs. I also strongly believe in continuous gathering of information and clues of change by scanning hundreds of magazines, newspapers, and business and trade publications from all over the world. My message is a sincere attempt to help the reader adjust better to the fast-changing philosophies, strategies, and operations of a business. Some companies will succeed; some will disappear. Economically, it's a zero-sum game; for every winner there must be a loser. But for millions of people, it's their life, their future, and their children's future. Executives have a responsibility to provide secure employment and hope for advancement for their people. Without them, owners and shareholders have no revenue, no profits, and no future.